As I am writing this post, I am actually craving for it. Yes, it surely is pretty addictive I would say (in a good way). After visiting this restaurant for 4 times, I concluded that it has become my favourite hot pot place in Penang! And I will tell you why. Having a catchy name, “As You Like Hong Kong Chicken Pot” always makes people wonder what kind of food do they serve. Was it claypot chicken (as it’s often misinterpreted that way) or was it something else? The correct answer is it is a HOT POT restaurant. So how did such name derive? Let me ‘decode’ for you. The business started off with their first Ma La (spicy and numbing) soup base, which is different from the common Ma La soup base (especially seen in China) where you see a thick layer of oil to preserve the heat. Due to the thick and hot oil, most of the time people are unable to savour the soup. All thanks to “As You Like” creation, we have a Ma La soup base which is made from soup broth and it is relatively healthier and drinkable! The best part is it does not have that thick layer of oil yet is able to bring out the aroma of Ma La. This creation has quickly become very popular among the Southern Chinese and Hongkongers, who prefer relatively milder soup base. The five main ingredients to make this delicious dry pot : star anise (八角), dried chilli (辣椒干), fennel (茴香), pepper (花椒), Kaempferia galanga Linn or simply known as sand ginger (三奈/沙姜). Not only they have hot pot, they serve dry pot as well and it is different from other dry pot out there because their dry pot is literally, ‘dry’. There is no sauce involved in the cooking and only dry ingredients and chilli oil (amount depending on the spiciness level you pick) are used, giving it a strong sense of aroma and taste. We highly recommend ordering the dry pot if you want to try something different. Our choice of that evening was dry pot with stingray, medium spiciness, and it was just perfect. For a quick meal, I would order just the dry pot and savour it with fragrant white rice. Photo captured during my first visit. Back to the hot pot. Our pick of the evening was definitely my favourite sour pig stomach chicken pot + tomato chicken pot. I have tried their signature Ma La soup during my first visit but we ordered mild level because other fellow diners could not take spicy so I would not say the Ma La soup I had gave the real impression. However, I still liked it and I will definitely go back to try their recommended medium level Ma La soup. I really love their sour pig stomach soup because it does not taste like the usual pig stomach soup which is peppery. Instead, they decided to make it special by adding in sour pickles and premium aged vinegar. The taste was elevated and had an extra kick! As for the tomato soup base, definitely go with chicken if you prefer thicker soup. During my third visit, we had the tomato soup without chicken and the soup texture was lighter comparatively. Now, for the ingredients, most of them are premium quality ingredients but here are some which are worth addressing. If you are there for occasions and don’t mind to splurge a little, the Japanese Wagyu slice (RM88 for 100g) is the winner! I still remember the tender slice lingering in my mouth with the aroma of beef fats, yum! Fried fish skin - dip into boiling soup for 5-6 seconds MAX. The imported Hong Kong mushroom pork ball has a relatively firmer and more chewy texture (often complimented as having “QQ” texture by the Chinese), and the imported fish skin dumpling was delicious as well. The dumpling skin was made from a mixture of flour and minced fish meat, and wrapped with minced meat filling. You MUST order their signature quick dips too (just dip in for 5-6 seconds max and there you go!). Their fried fish skin and homemade bean curd roll are must orders for me! You simply need to try them! Homemade watercress with honey and lemon - perfect drink for hot pot! Besides, they also have a variety of cold dishes and barbecue sticks which are popular as side dishes. As for beverage, I never miss their homemade watercress with honey and lemon. This drink is a perfect complement to the hot pot as it is cooling and refreshing. Lastly, finish off your scrumptious meal with the ice cream of your choice. My choice is definitely the chilli lemongrass sorbet which I loved so much I had to have double of that! Chilli lemongrass sorbet - MUST TRY! HK milk tea ice cream - for milk tea lovers! If you have not tried out “As You Like Hong Kong Chicken Pot”, please do yourself a favour and go for it. Oh and did I mention it is a great supper spot too as it opens till 2am (Come on, what is diet when it comes to great food!). 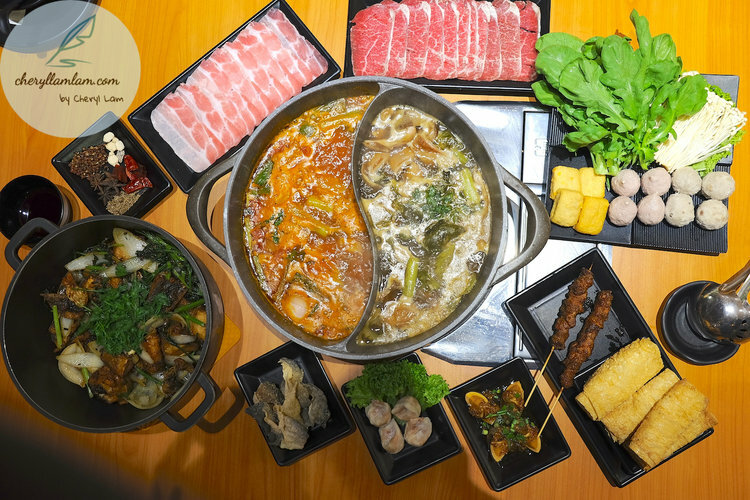 So guys, time to gather your friends and family to try out one of the best hot pots in town! AS YOU LIKE HONG KONG CHICKEN POT, PENANG. Address: 56, Jalan Chow Thye, Georgetown, 10050, Penang.